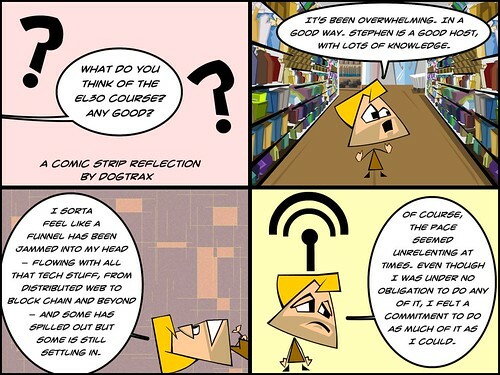 This sort-of final reflection is for E-Learning 3.0 with Stephen Downes, and the musings of my experience — here in the form of a comic — is part of what may be a final project around “community.” I say “may” because a few of us are trying to discern a path forward with the open-ended element of Stephen’s call. This thinking all relates to the possibility of how learning and teaching might unfold in the distributed web environment, where trust and a sense of belonging to something larger (even if you are removed from the center) is a key component to the way the future of learning, mostly online learning, might yet unfold. This is why we explored Block Chain, and elements of the Distributed Web, and Identity, as well as Credentials and Badging. Plus other topics I may have already forgotten. 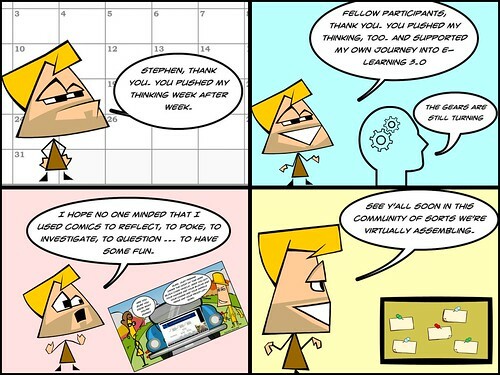 This entry was posted in comics, EL30. Bookmark the permalink. Yes – my thinking has been pushed too – as you say – in a good way, but not without its frustrations! Like you, I am having a problem with this idea of community for this week’s task. I perfectly understand the requirement for consensus (or think I do), but I cannot see that reaching consensus equates to community formation. 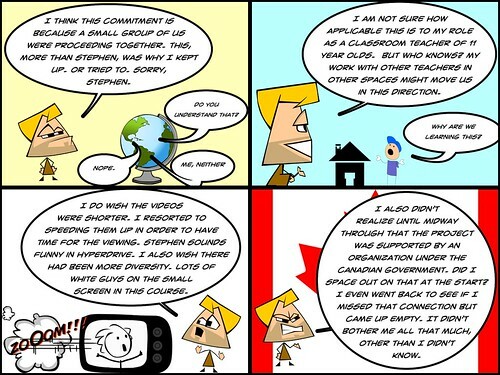 I’m hoping Stephen’s summary for the week will clarify what he means by this. ps I love your comics! New form of time: pasta boil. Just out of interest, do you write out the script first and then use Comics Head to find the right images. I own a copy of Nick Sousanis’ book – Unflattening – and I found the explanation on his website of how he designs his comics, fascinating. I usually have a general idea but I don’t write it out. Sometimes, with a single frame comic, it’s simple. With something longer like this, I had a sticky note with some main points. Since the app does the art for me (sort of cheating), I focus on the writing and then work the art to match the writing. Nick does things by hand, so his work is more complicated and more complex, more individual. Still, for me, this process works.